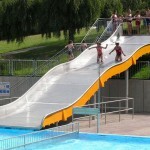 These water slides are available in various widths and lengths, for indoor and outdoor pools. 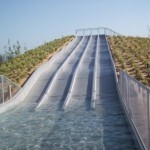 The slide bed is made of stainless steel (V4A quality or NF1.4401) and can be partitioned into separate lanes if required. You can choose to include waves and/or rebounds. For maximum safety, user traffic is managed by a traffic light combined with a timer or a photovoltaic sensor. They are manufactured to the dimensions and shapes chosen and specified by the customer and fit perfectly into their environment.